I said earlier this year I wanted to reach a 100 french novels this year, the main reason is there is so much great fiction coming from France in recent years and here is another writer I have found to add to the list . 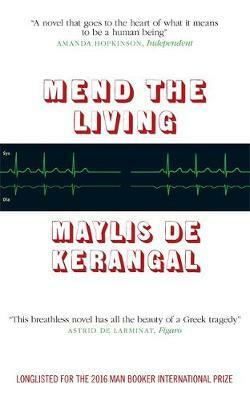 I know Maclehose have high hopes for this book and I as a reader can see why they have .This is Maylis De Kerangal fifth novel and the second one to be translated to English she has won a number of prizes in her native France. She lives in Paris. Hungry and early in the morning simon and his mates head to the Surf on a day that will be like no other for him .His last ! The book follows one day and a number of lives that follows one death and that is the death of the title character Simon a 19-year-old surfer full of life, he has woken very early to catch the surf as he usually does, what we see is the early morning race to the beach he has made many times before and the group of surfers there on the beach the sights and scents of being a surfer . Then this scene is blown open, when we see the accident that has happened to Simon and he is in an ambulance the action then follows to a nurse as he arrives at the hospital and his parents decide to donate his organs.We see how one man has touched so many over the space of one day from his friends and family to those he donates to and all those along the way in this rollercoaster last day of a French Surfer. Sean is one to make this statement and Thomas Remige gets up from his chair abruptly, shaky, red thorax expanding with an influx of heat as though his blood was speeding up , and walks straight towards them. Thank you. Marianne and Sean Lower their eyes, planted like stakes in the office doorway, wordless their shoes mark the floor leave sludge and black grass, they themselves are over whelmed by what they’ve just done, by what they’ve just announced – “Donor” “Donor” “don-ate” “Aban-don” the words clang together. The minute his parents choose to let him go their Simon. What we have here is an event that takes place every day and that is that someone dies, but they choose to live on in the donations they make of their organs. What Maylis has done is taken the moment this happens. This is like the Hadron collider of a book Simon on one side and the people he will help on the other side. are like the two particles waiting for that one moment this two collide and start a new life at the moment of creation ! This book is about heart Simons heart which goes to the heart of France Paris to be reborn in an Old woman.So Young man gives an older woman life from his own death. The prose is written in a fast furious style almost like the surf that Simon has ridden through his young life you are on the crest of a wave a vibrant writer and a vibrant translation by Jessica moore make this a ride that will leave the reader breathless. Previous Slow homecoming by Peter Handke Next Man Booker international what will be there ? @Pat It sounds as if it would make a brilliant play. I do love a book that follows the effects of one dramatic event. I can’t think of one book I’ve read about organ donation, which seems strange now I think about it. I’ve read about 80% of Mend the Living so far and I’m so glad someone else is reading it too! I really love the prose/translation and it’s a fascinating subject for a novel. I hope it’s a contender for the MBIP this year.